India is growing more wheat than it ever has. That may sound like very good news given the fact that India (along with China) is the largest consumer of wheat, but the fact is, it does not quite know what to do with it. India doesn’t have policies that will allow the country to use the wheat efficiently. It doesn’t even have enough place to store it. There is also no surety that wheat production will be equally robust in the coming years. The current state of plenty is just two seasons old. Following the bumper harvest (80.17 million tonnes) of 2010, the country is now looking at another 81.74 million tonnes in a harvest season that has just begun. “The last couple of years, we have had a good monsoon and hence the production was good. But if we have even one bad monsoon, we will have a shortage,” says Anjani Sinha, MD and CEO of the National Spot Exchange. These bumper harvests are the outcome of a two-pronged government approach of banning exports, and raising the minimum support price (MSP) as an incentive to bring more land under wheat cultivation. The gains at the height of the Green Revolution in the 1970s and 80s — riding on the back of high-yield seeds and pesticide use — have been slowing down. Between 2000 and 2010, the land under wheat cultivation grew by just 1.21 percent and there was a drop in yield (compared to the 1980s). Wheat production had fallen to 9.23 million tonnes in 2006-07 and export was banned in October 2007. However, such an approach doesn’t provide sustained support for wheat farming. With exports being banned, that means the government ends up being the only buyer from whom farmers get a good price. 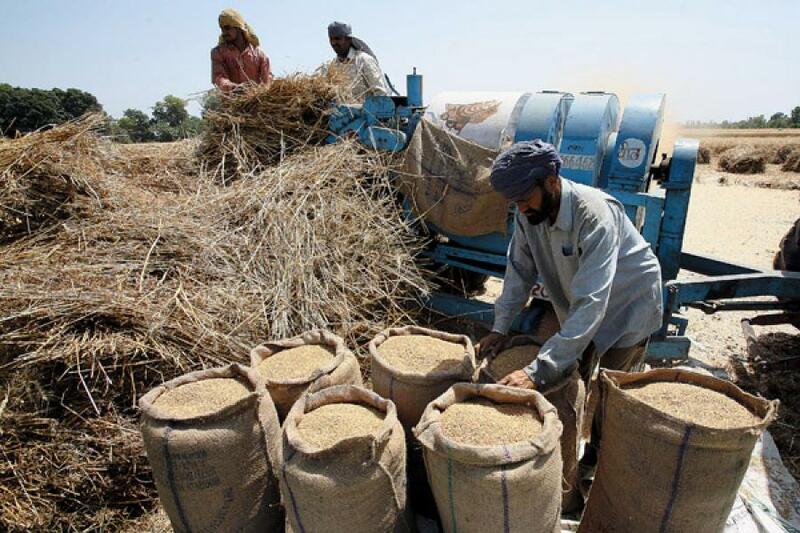 With domestic prices stagnant for the last six to eight months, and no export options, farmers will soon move away from growing wheat, fears Kunal Shah, a commodity analyst. Agriculture is a politically sensitive issue and that makes this problem more complex. “The government wants to be seen to be doing something to counter food inflation and therefore takes steps like banning export of wheat and raising the MSP. But, in reality, it is the price of oilseeds, pulses and milk, and not wheat, which is pushing food inflation up,” says Shah. The other part of the problem is that the government is not equipped to efficiently store and use bumper crops for future consumption, thanks to the pathetic conditions of the warehouses run by the Food Corporation of India (FCI). Enormous volumes of grains rot every year. The total capacity of government granaries run by the FCI stands at 28.86 million tonnes, a large portion of which is already full with earlier stock. For instance, granaries in Haryana are 78 percent full while those in Punjab are 72 percent full. The two states are among the largest wheat producers in the country. Many other wheat-producing states do not have a good network of granaries. But there are ways out of this problem of excess. #1: Encourage Private Players: Shah and Sabnavis both believe that encouraging private players in the procurement and storage process will enable the government to absorb the production from states where FCI infrastructure is inadequate. In its attempts at increasing storage capacity, last year the FCI started a scheme to invite private participation in building more warehouses. The plan invites private players to build granaries and the FCI guarantees at least 10 years of rent for them. So far, deals to build 10 million tonnes of storage have been signed but these granaries will be completed only by next year. #2. Limited Procurement: Sabnavis says the government should set a quota for how much wheat it will buy from farmers, and let them export the rest or sell in the domestic market itself. #3: Build Strategic Reserves: For safety from fluctuations in supply, globally as well as domestically, maintain a constant stock of wheat by creating long-term storage facilities. This will ensure food security. It will also give clarity on the possibilities of exporting wheat when international demand is high. The global wheat scenario is already raising concerns in many countries. Russia, the world’s third largest exporter, stopped wheat exports after it lost a quarter of its crop last year to its worst drought in 50 years. China, the world’s largest producer, too may lose about two-thirds of its crop after an exceptionally dry winter in its wheat growing region. The impending shortage in the import market has pushed global prices close to their all-time high of 2008. Countries in West Asia and North Africa are stocking up with orders being placed for several thousand tonnes. This points to fears of an impending crisis of availability and price. Russia had announced its intent to build strategic wheat reserves along with China and India and even give out 20 million hectares in joint ventures for wheat farming in early 2010. This would protect Russia’s wheat prices and be a counter to the US’ wheat diplomacy (the US is sitting on a stockpile of 30 million tonnes). But that, of course, was in the months following Russia’s 100 million tonne production and before drought brought that figure down to 60-65 million tonnes.